The Cards Against Humanity Nuisance Committee purchased an anti-Trump billboard near O'Hare International Airport. CHICAGO -- Cards Against Humanity's Nuisance Committee super PAC launched Wednesday by buying its first anti-Donald Trump billboard just outside Chicago O'Hare International Airport. The committee was named for a part of Cards Against Humanity co-founder Max Temkin's family history. According to the Nuisance Committee, Temkin's grandfather Ira Weinstein was shot down over Germany during a combat mission in World War II and interned in a POW camp. At the camp, Weinstein and other Jewish POWs banded together to form a "nuisance committee" to irritate their Nazi captors in ways that wouldn't get them killed. In a press release the group said, "The comparison between Trump and Hitler is intentional." 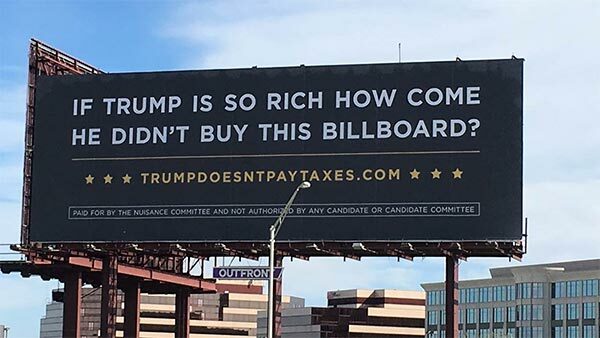 The billboard reads, "If Trump is so rich how come he didn't buy this billboard?" and directs people to trumpdoesntpaytaxes.com. The super PAC's funds come from the ongoing sales of Donald Trump- and Hillary Clinton-themed expansion packs for the popular card game. "At the end of this promotion, Cards Against Humanity will tally up the sales of both packs, and depending on which pack gets more support, we will donate all the money in support of Hillary Clinton's campaign," they said on their sales site. In their FAQ, Cards Against Humanity clarifies that funds will be split between contributions to Hillary Clinton's PAC, contributions to groups opposing Trump and get out the vote programs in swing states. Trump made a fundraising and campaign stop in Chiacgo and the suburbs Wednesday. Clinton is expected in Chicago Thursday.